Before I begin this post, I just wanted to link you all to a foodie interview I was lucky enough to do on the awesomely talented Maureen’s blog, The Orgasmic Chef! What do you do that’s a little… off. Do you wear your shirt backwards because you like that side better, eat jam on both sides of your toast and secretly fancy 2 minute artery-clogging meals? We both have an unhealthy penchant for miniature useful little computer gadgets. Also known as USBs. But not boring, stick-in-computer-and-use USBs. I am talking cute, lil darlings. OVERLY I-LOVE-THEM cute. I been jipped man, there ain’t no coke in dis! Dam, brought the wrong apple to feed Snow White! As I mentioned above, my family has many particular habits which makes them my family. If there was an imposter of my grandpa and my mum made, you know the way I would tell which one was which? I would ask them in the morning straight after getting up if they wanted tea and a cookie. Not for breakfast. As their I-have-just-gotten-up snack. The imposter would say no. I was further forced to make it (I know the burden I take on right?) because I saw Baker Bettie’s post and I fell head over heals in love. You should definitely check it out here! 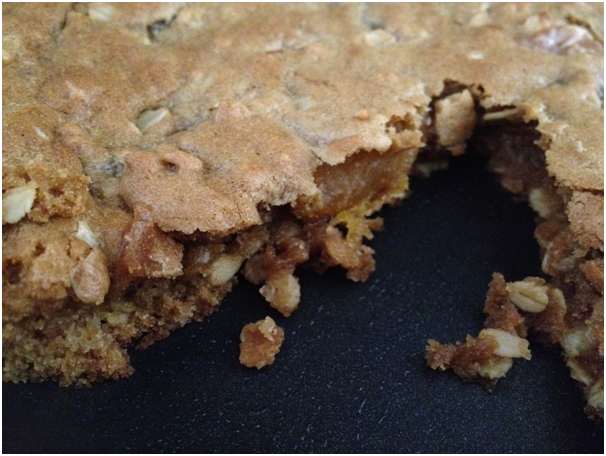 Here are my changes to this amazing skillet cookie! I increased the amount of oats to 3/4 cups, decreased the amount of flour to 1 cup because I like my oats in the morning! 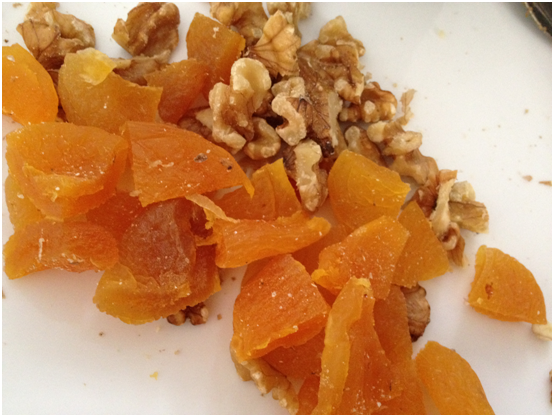 I used chopped dried apricots to sub in for raisins since they are so bright, sunny and orange, they always remind me of the morning! I just wanted to first apologise. My spam has been working a little over actively and I have recently discovered that it has blocked out over 20 real comments per post! Sorry about that to everyone who are getting random replies a month after posting! But most of all sorry to Geni @ Sweet And Crumby, Jennie @ The Messy Baker, Sze Hui @ Ohfishiee and Sandra @ The Foodie Affair since every single post, their comments were spammed! AND NOW LADIES AND GENTLEMEN, I present to you the chocolate dish of the… post! A fabulously rich not double, not triple but a QUADRUPLE Chocolate Cheesecake at the fabulous A_Boleyn’s blog! Enjoy the rest of your week my friends! P.S. Daisy (at Never Too Sweet) thank you very much for your generous awards 🙂 – I will be passing them on in a couple of posts time my friend! You are so talented! Loved the interview. I still believe you should write a cookbook! Between your writing, food photos, and recipes; many would purchase it! I will be blogging about them in 2-3 posts time – thanks again! We should totally tell WordPress – she is so nice and far from spam!! Those USB are pretty fun. Love that camera one.. 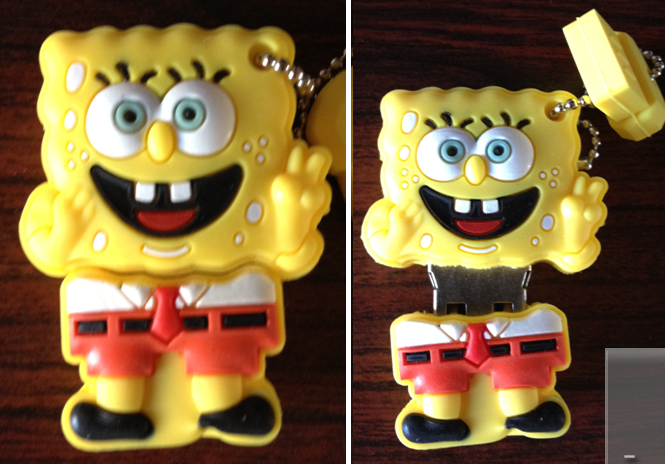 I like both the sponge bob and coke USB but vote for just sponge bob. You looks amazing being featured your interview at Maureen’s blog! You are so talented in your cooking and I like your personality. I think that you should join the Aus MasterChef! Though I don’t think I would be a fan of the pressure! I love the idea of an “I’ve just gotten up snack!” How fantastic is that? I love the idea of a breakfast cookie too. The maple and oats sound great in it! Thanks for enjoying the cookie, I promise you will not be disappointed my friend! oh my gosh, I would LOVE that for breakfast! I want that breakfast skillet cookie or whatever you want to call it.. looks perfect for brekki.. and congrats on the interview! So glad you are unspammed now! I enjoyed the interview that you did. It is nice to put a face to the name and learn a little about your family. It is wonderful that you blog is enjoyed by so many people. 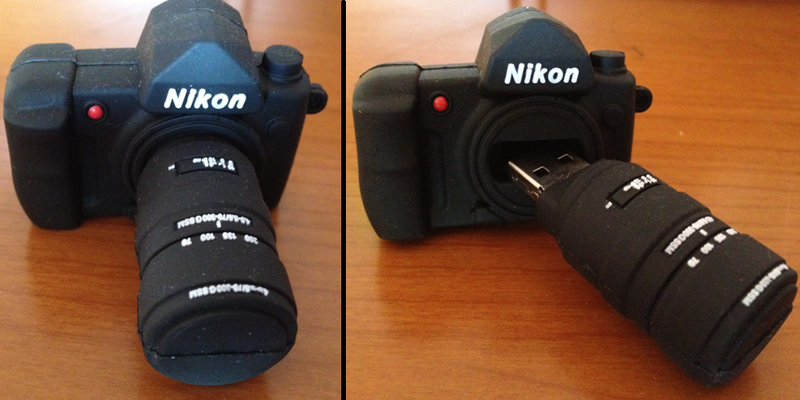 Loving this post, the camera usb and your interview: today I learnt a lot about you! I am a shoe freak. There I said it. Not just any shoes, but the stupidly high and pointy sort. I have my 10 minute walk shoes and my sitting only dress shoes. The heart was my favourite because I also really love bling, but sadly I am unable to wear most bling because I am allergic to nickle. That cookie is OUTRAGEOUS. You are very lucky you are still young with a good metabolism. That’s all I can say. I loved Maria’s cheesecake, it really was gorgeous. I love shoes. Freakishly high heeled shoes? YES! Cookies for breakfast… I love it! And those USBs are too adorable – where did you find them?! Cute Sponge B. And that Skillet Breakfast Cookie is just sinful..but calling my name to try it LOL! Great post CCU! Thanks for enjoying my friend! We all have awesome little weird habits. I always save the best bite of any food dish until last. It’s looks a lot weirder than it sounds–if you ever eat with me, you’ll see 😛 And I love that you made Baker Bettie’s cookie! Looks amazing! Thanks for enjoying my take on her cookie! Everyone should vote for the coke can! Btw, I couldn’t believe you’re only 16! When I was 16, I was still drooling in bed?! From your bakes and posts, I could have sworn you’re much more matured than i am. That goes without saying, age does not mean maturity. But you’re pretty, you’re smart, you’re very very very pretty. At least tell me you can’t dance. 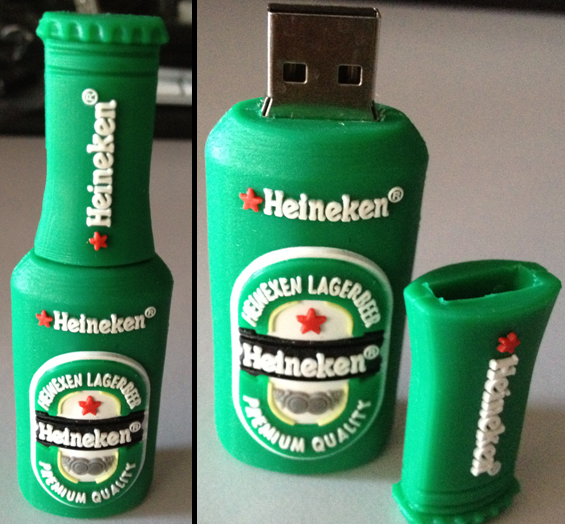 Oh my gosh, now I want some cute USB drive covers! Congrats on the interview! You rock! mmmm, I’m drooling. Those all look so delicious and I love the little Nikon. How cute! And great choice, it is all cuteness for sure! Definitely love your way of thinking about appropriate breakfast food. Makes perfect sense to me. Breakfast cookie–I love it! Hmm. Eccentricities. I must have a book on me at all times, just in case I get caught with nothing to do for even two minutes. Thanks for enjoying the cookie! This was such a funny post- I didn’t know there were so many cute little USB memory sticks, as we call them. I love this recipe, too. This is one is a definite must-try-soon since it has all the yummy and healthy things together in one dish! I would eat this cookie for breakfast. Every. Single. Day! Have a wonderful week as well my friend! A fantastic post Choc Chip! and why not have a pre-breakfast snack?! Oh and I voted for Sponge Bob 🙂 But what I want to know is how come I’ve never seen USB’s like these before. I need to remedy that!! Thank you 😀 – glad to see you understand! I hope your little guy devours it like me 😉 – too cute! Nom nom nom!!! They all look so good!!! Your little USB buddies are so cute 🙂 One thing I think is peculiar about me is that I love banana bread but don’t like to eat bananas! Love that camera USB. Adorable!!! Mmmmm everything about that giant cookie breakfast is screaming my name – eat me heather, please make me and eat me I taste so good. Such a fun post! You’ve got an entertaining writing style. I read the interview – it was great! And I see nothing wrong with having a cookie for breakfast. 😉 Great read – thanks. And glad you enjoyed the interview my friend! i love camera USB! 🙂 photography addict here. All the USB’s are so cute but I voted for camera! Kinda surprised to find out that it has the highest # of votes so far! Awesome recipe. Can’t argue with the idea of a giant cookie for breakfast. ; ) Love your usb collection. Hard the choose a favorite, but I went with the camera. Now that is a delicious way to start any day! And there are oats so it has to be healthy, right? 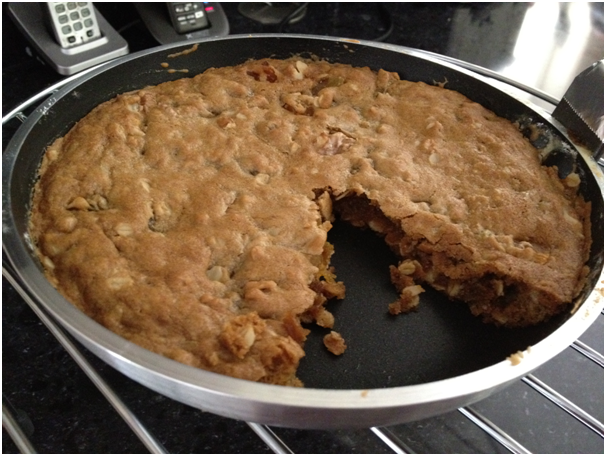 Thanks for enjoying the giant cookie – I love making things in skillets not, truly it is awesome! I don’t think I’ve ever seen such adorable USBs! I had no idea they even existed! It’s a cute eccentricity to be sure. Cookies for breakfast always sound good to me! this looks so delicious! Also very happy you enjoyed the breakfast cookie! So creative, love them all. Love your breakfast too, has all the food groups in it so has to be good for you. Way to start the day. And thank you for enjoying my friend – your logic is genius! 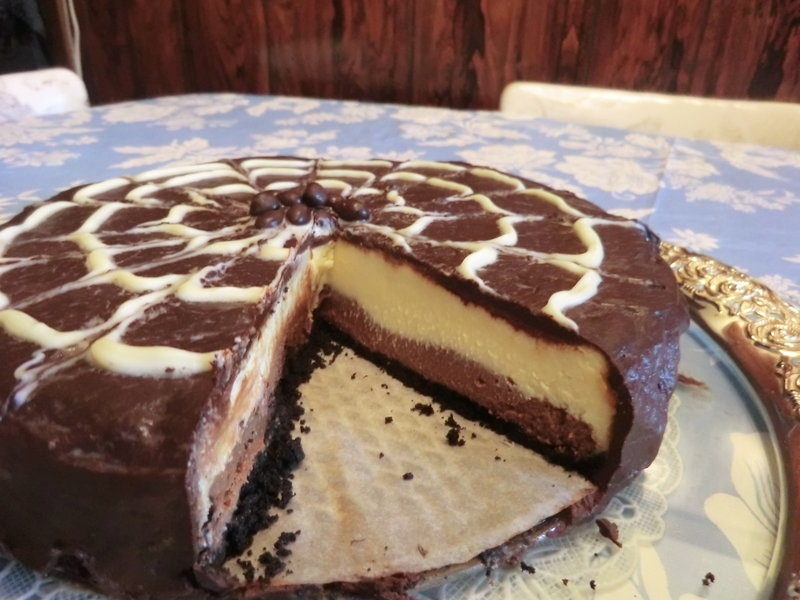 I have also admired A_Boleyn’s Chocolate Cheesecake. She is the master of decoration! The giant oatmeal cookie reminds me a bit of ANZAC biscuits I love. It looks fantastic! The USBs range you own is amazing! I had no idea such things are produced. A pleasure to visit your blog! 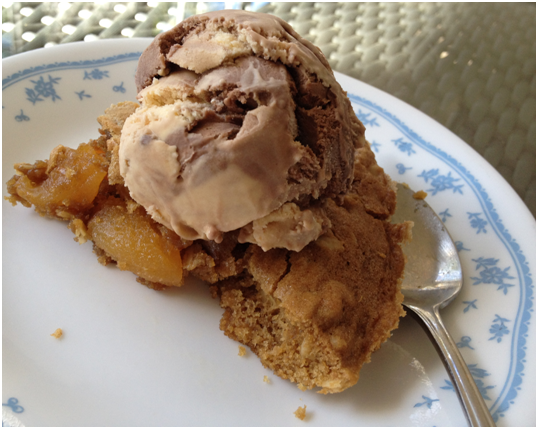 Yes it is time to crank out the apricots, this is a delicious inspiration. I would have licked that plate clean. Also, congrats on the interview over at Maureens blog, Maureen is such a sweet blogger. I will need to pop over their and review it later. Anyhow enjoy the day as well as that breakfast cookie! Looks delicious and lovely clicks!!! And thank you very much! Such a sweet comment like yours always makes my day! ok first let me say that i LOVE the name of your blog. awesome. second, those USBs are adorable. third, that breakfast cookie? ah mazing. so glad to find your blog! Thanks 😀 – it was very impulsive in creation! Both the cookie and the cheesecake look wonderful! I could not choose just one USB port as a favorite – they are all so very cute I can see why you and your dad are collecting them. Peculiar habits are the basis of humanity. Cookies for breakfast sing. Am a firm believer in getting my anti-oxidants from dark chocolate! What a delightful post! You sound like a soul mate in baking for me – breakfast cookie believer and dark chocolate lover? Nice one! this looks so delicious.. i’ve never seen a breakfast cookie… i’m bookmarking, and will make it in the near future. love. And it was a pleasure to visit your blog – are you on foodbuzz? Cookies for breakfast?! Yes, please! That’s a very tempting breakfast cookie, Uru. 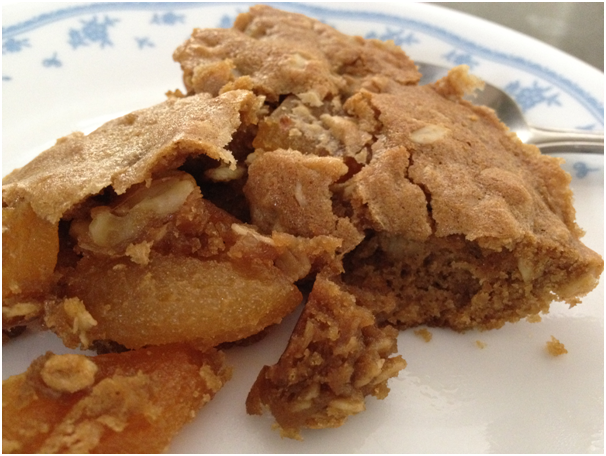 And I don’t really like sweet things for breakfast but can totally see having some of this cookie and LOVING it! I was at Maureen’s blog and finally got to see your pic 🙂 Beautiful girl 🙂 And are you sure you are only 16-yrs??? 🙂 I don’t know what the heck I was doing at that age… Love the recipe Uru! I love all those flash drives. So cute! I have feeling i shouldn’t be looking at all this heavenly sweet goodness now, It’s tempting to go for my jar of nutella beyond belief. And you certainly did – with tons of dried apricots too! Glad you enjoyed the usbs too! What a tasty breakfast and cool usb memory sticks! Great job! CCU, your blog is full of such fun things today (as always). Loved reading about you and finally SEEING you on the guest post. Sixteen, beautiful, talented–I’m a little bit jealous (not really, I’m happy for you). 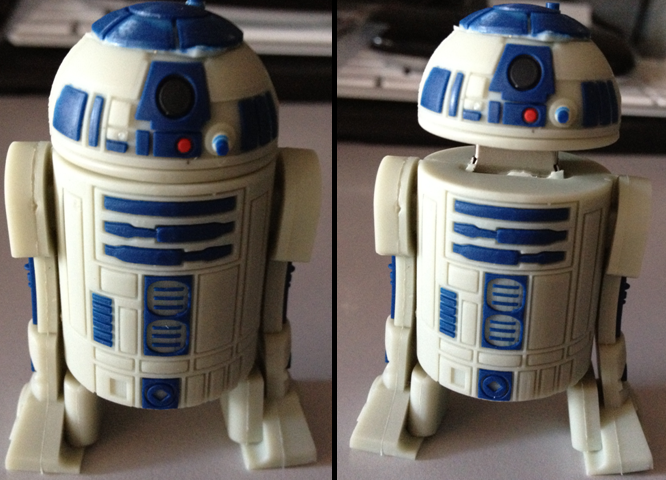 I had to vote for R2D2 since my son (about to turn 40) had a toy one as a child. You hit the jackpot again with your breakfast cookie. 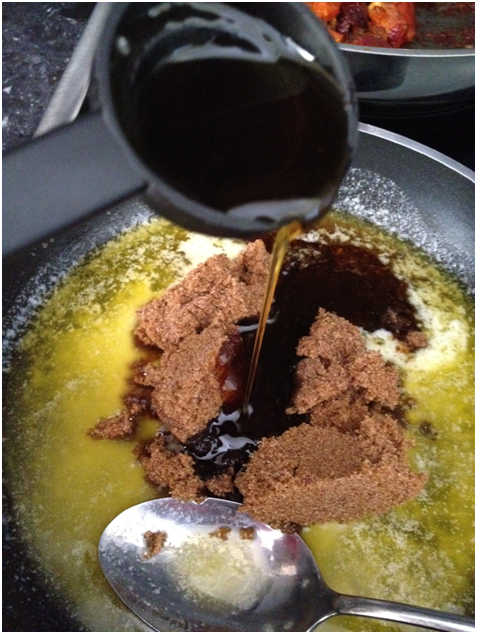 You may even be changing the world by creating a new popular/healthy breakfast… cookies, yay! You are very sweet my friend! Nice guest post over at The Orgasmic Chef! And I love the USB’s! Such fun. I sure wouldn’t mind walking into my kitchen and finding that giant cookie on a plate for my breakfast! That “breakfast” is amazing! 🙂 And love all those usb drives. all of them. so unique and cute. And the usbs are definitely all adorable! You are tooo cute and funny! Loved your USB’s! My hubs would die for the coke and the R2D2 USB’s but me, I’m a girly girl and love the blingy heart-I would totes wear that on a necklace! 🙂 I love that your Mom and Grandmpa eat cookies first thing in the morning before breakfast. But I need you to help me clear up my confusion regarding cookies. I thought British people called them “biscuits.” Not that you’re British, but the British and Australian accents are so close, I guess I expected you to also call them cookies. LOL! Am I crazy? Don’t answer that. 😉 I saw Baker Bettie’s Skillet Cookie and loved the idea–great job making it healthier for morning consumption! It looks lovely. And no you are the furthest thing from crazy! Cookies for breakfast.. Gal u rock!! And you are a friend after my own heart if you accept cookies for breakfast! That may be the best breakfast ever! Or at least it would be in my house. YUM! Also how can R2D2 not have more votes! Thats the coolest usb by far. Glad you enjoyed it! And good USB choice! Love those USB’s, cool collection! Cookies for breakfast, best idea, it looks fantastic. Way to go U! !Your blog is already growing by leaps and bounds and rightly so since you’re so talented!! And good taste in USBs no doubt – also glad you enjoyed the giant breakfast cookie! And thank you also for the comment you left on the interview my friend! Cookies? For breakfast? I feel that there should be a chorus of angels singing your praises right now. It is quite the heavenly breakfast 😉 – Thank you! That sounds like such a fun habit – nothing like some pen and paper so I know how you feel! I am just hoping over from maureen’s where i read your interview. So impressed, you are only 16 and are a multi tasker. You are one of my favorite bloggers and i enjoy reading your blog very much. You are an exceptional baker and very creative. Lovely to read about you. Thank you very much my friend 😀 – You are very kind! I’ve just visited Maureen’s blog before I even knew about your post here so had to come back and state how incredibly inspiring you are for young people today. Baking since 13? For reals? Seriously, you ARE awesome. I’m almost 31 on the 24th of this month *sob*, when I was 13 I never even thought about cakes unless it was going through the store and me pestering my mum to buy one. I must’ve been too busy chasing the boys at that age, hehe. I’m so impressed that you’re only 17 and had this blog since you were 15. Your baking is amazing and inspiring. You truly are a wonderful person. I won;d not be surprised if you were approached within the next few years and became our latest Nigella, Jamie Oliver, etc. of baking. 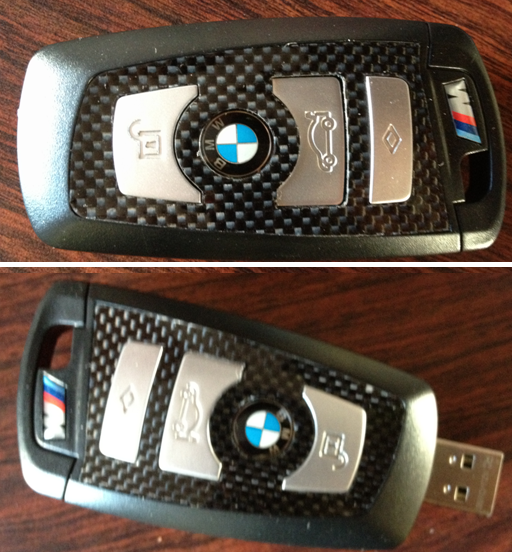 My favourite USB is the car keys but only because it’s a BMW M3 key. LOL. I’m into cars. Your comment has made my day my friend, I cannot even begin to thank you! My friend, I dream of one day even meeting those chefs – being one of them I think would actually be heaven. They are so inspiring! And nice choice on the USBs – the car keys are so real! I hope you enjoy it and just send me a buzz – thank you so much for asking my friend! 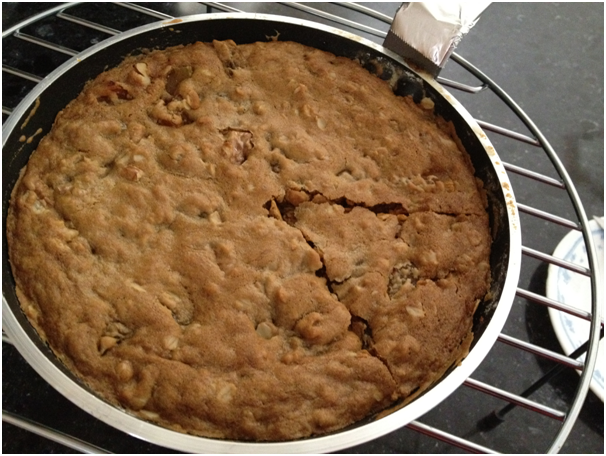 Loved reading your interview…and this giant cookie looks yummy! 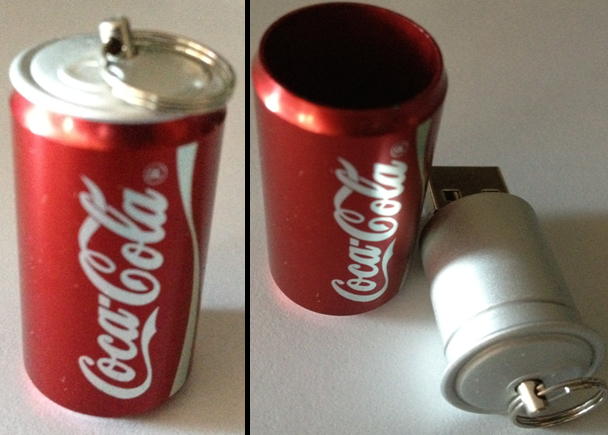 I’m going to keep my eye out for some of those interesting USB drives ~ mine are so boring compared to those! Nice to know I am not the only undone by their adorableness! 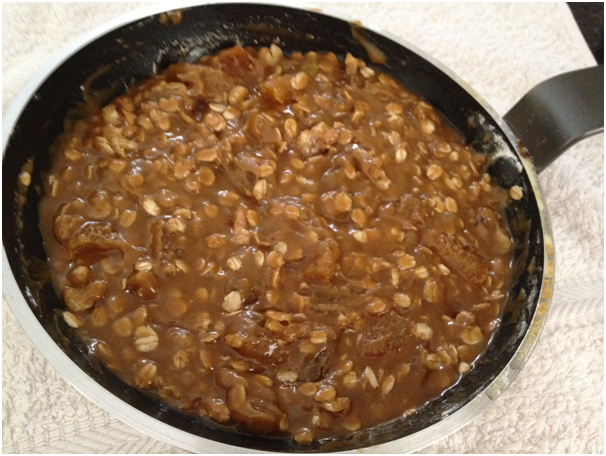 Apricot and oatmeal sounds amazing! I love your Giant Maple Oatmeal Apricot Skillet Breakfast Cookie! Loved the interview! And I love all your cute USB’s–I have never seen any that cool! Your skillet breakfast cookie looks amazing! I loved the interview Uru! The breakfast cookie looks divine and delicious! If it has oats in it, it qualifies as breakfast! And glad you enjoyed the cookie – I like the way you think my friend! What a collection! I love it. And that cookie – I would totally eat that for breakfast! Congrats on the interview! 🙂 And gosh this looks awesome! I would totally accept a cookie in my sleep! I would accept a cookie from you anytime ha ha 🙂 I love the apricots and the maple syrup. This would be the perfect breakfast! My Guru Uru, I don’t know where to start? I did not that you still remember my email. thanks!!! Your interview took me back 30years. I wanted to take Interior designing as my career and keep baking as my first passion. It still is but I do not get to bake as much as you do. I would really want to have a slice of that cake lovely cake. No kidding:) I eat all fattening foods at my age but in moderation. Good voting choice by the way! And I am glad you have not completely cut back – for me, fattening foods make you happy, but in moderation, even happier! Half the fun of life is having eccentricities. 🙂 I think your drives are adorable. And I would feel perfectly wonderful eating that cookie for breakfast – since I occasionally eat regular ones – this would be a step up. Take care and good luck on your exams. Thank you my friend and have a wonderful week! Cookies for breakfast! Once again I say that my girls are going to love you! It was so great to learn more about you in the profile! You can cook in my kitchen anytime — it would set a great example for the girls since you always clean up along the way!!! I’d eat that for breakfast any morning! I’ve never seen USB’s like what you have and I only have the boring ones 😦 Love the collection so far. I voted for Sponge Bob because your comment made me laugh out loud, but I also like the heart because I love shiny bling! And I agree who can resist a little glitter! Funny post and congrats on the interview. I’ll check it out for your sake. Have a great weekend. Thank you for enjoying and hope you enjoy the interview! That cookie looks amazing! Lucky you. All your USBs are great – I never knew there was such a selection! You’re absolutely made over there … eating cakes for breakfast !!!!!!! Love my breakfast muffin, but a cake … thanks for the link to for the Bettie’s cookie cake … check her recipe out and the this with Greek yoghurt on top – I would have breakfast the whole day. 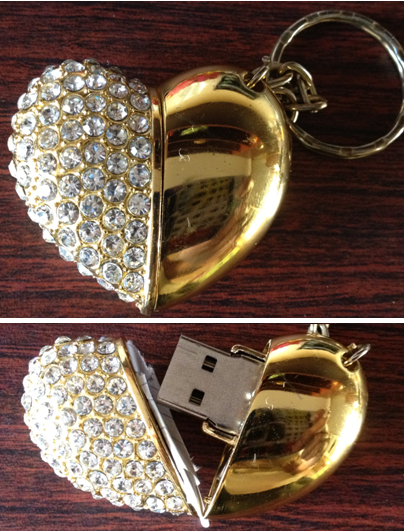 Thank you so much and by the away I’m surprised that the “broken heart” usb are leading … we girls like our blings. Thanks for a great post. The Diva feeling is a great feeling *smile – yes, I will try out the breakfast cookie too. It looks the business. I want this cookie and I want it now. And congrats on your interview! Love this post and we all have our eccentricities, those usb computer miniatures are fab, I’m partial to the BMW, I would totally have that delicious cookie for breakfast ice cream and all. Reminds me of Bill Cosby when he gave the kids chocolate cake for breakfast when his wife was away. his rationale was that it had milk and eggs and thats breakfast right?? Great post you have a gift my friend. You are 16 yrs, well I can see a very bright future for you. I applaud your beautiful blog, amazing baking abilities and you are a very gifted writer. Kudo’s to you. I am blown away. Breakfast cookie … what a concept! I would eat that breakfast cookie and I like the Coke can. Off to read the interview now. Good choice with the USB, it is a favourite of my dad’s too! Giant breakfast cookie!! An admirable peculiar quality :-)! Love the USBs. I’m in an elegant mood so the jewelled heart is my pick today. And thank you for sharing my cheesecake pic. Hmmm I like anything baked that you’re allowed to eat for breakfast 😉 this looks lovely! COOOOOOOOKIES FOR BREAKFAST! I dig. This is brilliant. So, so good. And I read the interview on Maureen’s blog. I had no idea you were a Little Baby 🙂 It’s so awesome that you’re out on the blog scene holding your own with use old bitties. WELL DONE! Oh, my gosh, not one, but TWO amazing recipes!!! I love them both…I’ll have the cookie for breakfast and the cheesecake for dessert 🙂 Off to check her post! And I like the way you think! Love the USB’s! I had no idea they have become so creative. I have got to go find some! I am trying to lose some extra poundage but can’t help but drool over that cheesecake. I’m sure they are a growing trend! Yum!!! Look wonderful! 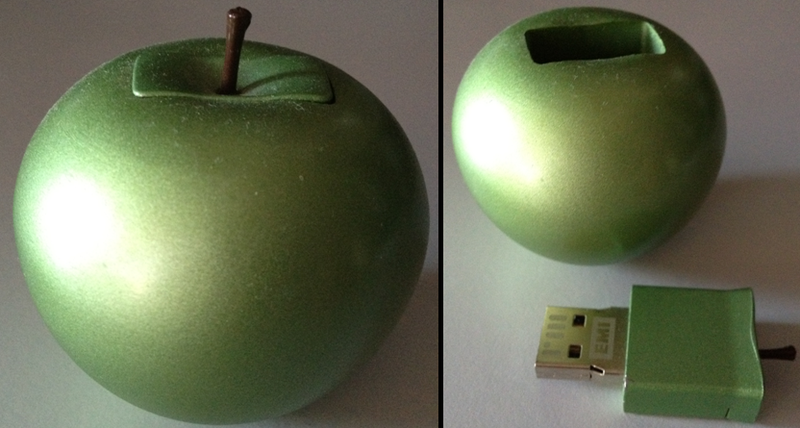 I also really liked the flash drives….all very cute and certainly not boring. But the chocolate cheese cake – oh yes!! YUMMY!! I know right? I was dying, still am dying, for a piece! Cool gadgets ! 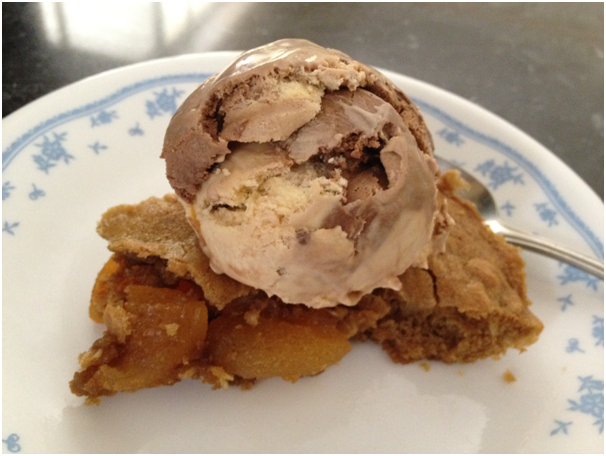 That apricot does add color and taste to your fabulous skillet cookies! Have a great weekend dear. Hope you too have a fabulous weekend! I’ve never seen the fun shaped USB’s before. I would go for the heart 🙂 Your breakfast cookie sounds delicious. I’m not much for sweet breakfasts but Brian is and he’d love a breakfast cookie. Of course, to get it I’d have to get up EARLY and make it for him…not gonna happen… 🙂 Congrats on the interview and awards. Haha the heart is totally girly and pretty – good choice! Pretty great collection of gadgets you have shared and its nice to keep them as long as we treasure them. I would like to start my day with a brunch with the oatmeal recipe you have shared. They are healthy but breakfast is not for me. I love your particular trait, that is so cool!